Path Breaking Meal Replacement Formula! is a one-of-a-kind meal replacement formula based on precise daily requirements of a healthy body to sustain organic life. Use of it not just helps losing weight, but it also increases the energy and immunity level of the user. This is made from high-quality Whey protein as the primary constituent to make the whole product safe and coming from a vegetarian source. shake for 24 days only! The smirks over my plump body are now completely disappeared and same faces are with an astonished look on them with me turning fat to fab in such short period. Thanks to Slim24Pro! My work routine led me to a lifestyle where I cared less for self and the result was an overweight body and dipping energy levels. Slim24Pro brought me back in shape. I feel healthier, fitter and full of energy now! It is so amazing. With my slim and healthy body, now I can dance as much as I want and it is extremely convenient to use too. I advise all of you to give it a try. With 97 Kg weight, I never even thought of participating in a full marathon, forget about finishing it. But I did, and finishing Mumbai Marathon was an achievement I'll cherish for life. Slim24Pro is a complete diet to not only make you lose weight fast but to keep you fit and healthy too! I lost 29 Kgs in 3-4 months. It never made me crave for food while using it and results are for all to see. I feel super confident with my new physique. The transformation turned me into the same Shiwali I used to be, 24 kgs slimmer and full of energy and dreams! Slim24Pro works real fast without leaving you tired and fatigued, which I experienced when I tried dieting. 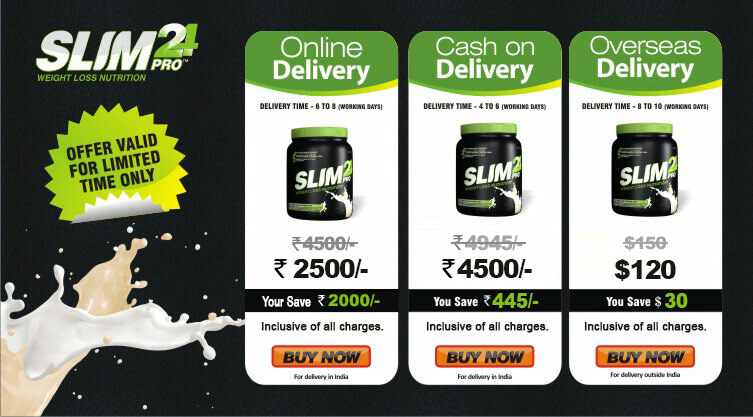 *People with BMI of 25 or above are the ones benefiting most from Slim24Pro. Avoid taking it for weight loss purposes if you fall under normal or below-normal range.